In this hot weather what could be better than an easy to make absolutely refreshing soup? 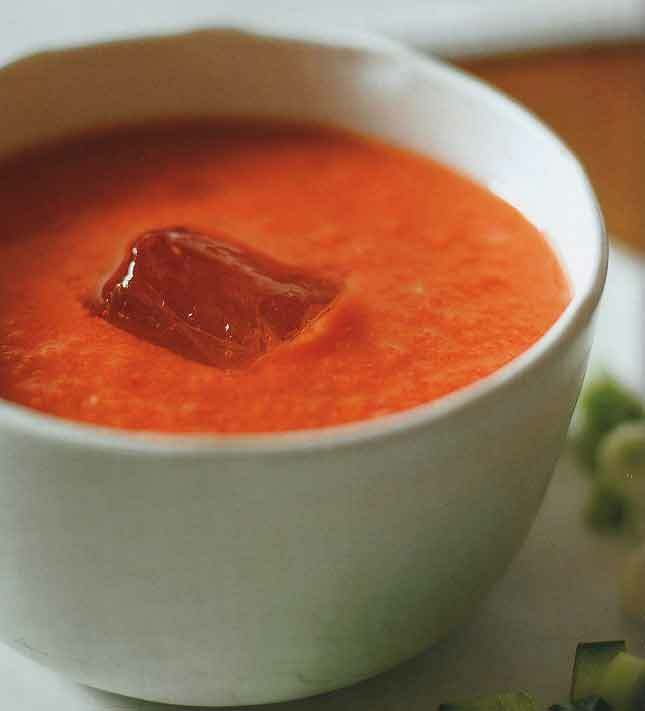 We featured a very different recipe for Gazpacho (by Chef Laura Frankel), about two years ago, and I felt it was time to revisit it. Tear the bread into pieces and place in a blender. Process briefly to make breadcrumbs and transfer to a large bowl. Add the tomatoes, garlic, bell peppers, cucumbers, olive oil, vinegar, and tomato paste. Mix well. Working in batches, place the tomato mixture with about the same amount of measured water in the food processor or blender and process to a puree. Transfer to another bowl. When all the tomato mixture and water have been blended together, stir well and season to taste with salt and pepper. Cover with plastic wrap and chill in the refrigerator for at least 2 hours, but noi more than 12. When ready to serve, pour the soup into chilled serving bowls and float an ice cube in each bowl.